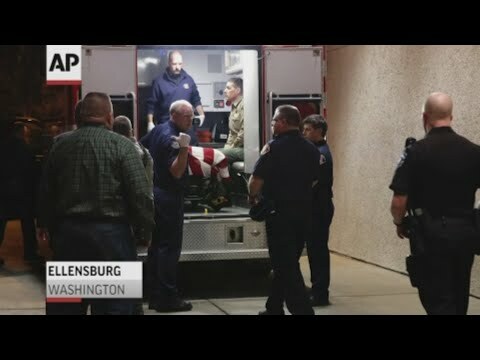 SPOKANE, Wash. (AP) — A sheriff’s deputy was killed in central Washington state and a police officer was shot and wounded after they exchanged gunfire with a road rage driving suspect, authorities said Wednesday. The driver was also shot and later died at a hospital. The suspect, who has not been identified, was chased by police until the driver stopped the car near the town of Kittitas. He got out and exchanged gunfire with the sheriff’s deputy and the police officer, Wade said. The suspect died at a hospital and Wade said authorities were still trying to identify him. Authorities did not provide information about how many times he was shot and Wade said he did not know how many shots were fired overall by the officers and the suspect. Wade said authorities have no other information besides the road rage incident for what might have prompted the suspect to flee and exchange gunfire with the officers.